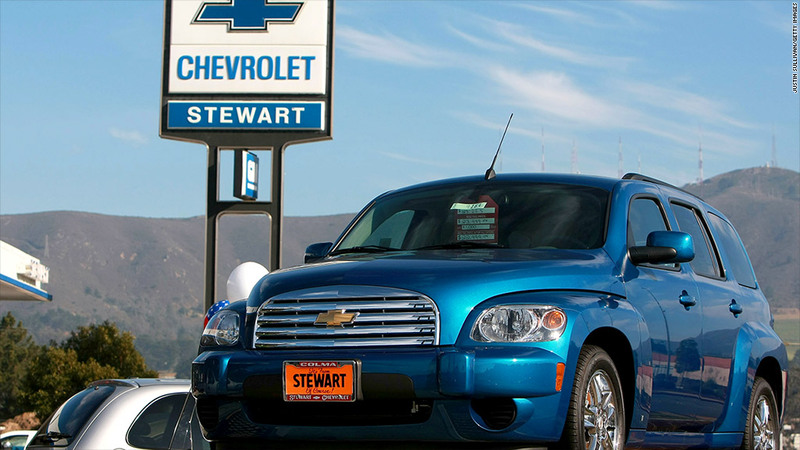 What's going on with GM's big recall of 2.2 million U.S. vehicles? GM has recalled 2.2 million cars, including the Chevrolet HHR, over a defect in the ignition switch that can turn the car off unexpectedly when it's on the road. What's the problem? The cars' ignition switch, where the key is inserted and turned to start the car, can easily be knocked out of the "Run" position into the "Off" or "Accessory" position. This can happen if the key is jostled by a driver's knee, for instance, or if the car hits a bumpy patch of road. The loss of power means the power braking and steering, as well as the airbags, can stop working. What cars are involved? The cars involved in the recall are the Chevrolet Cobalt and HHR, Pontiac G5 and Solstice and the Saturn Ion and Sky. Initially, the recall involved model years 2003 through 2007. Not all of these models were available through all of those model years. On March 28, GM recalled model years 2008 through 2011 because about 90,000 faulty switches were used to repair some of those vehicles. Barra said the move was "out of an abundance of caution." Of the 2.6 million cars recalled worldwide, 2.2 million are in the United States. How many people have been killed? GM acknowledges that at least 13 deaths are linked to this problem. The non-profit Center for Auto Safety says there may be as many as 303 deaths that could be tied to the defect. But the organization simply counted every fatal crash these cars had where the airbags failed to deploy. GM says the report misrepresents raw information about crashes. It's important to keep in mind that there are many reasons airbags don't deploy in a crash, beyond an ignition switch failure. So the 303 figure doesn't tell us much. All we can say, for now, is that the number of fatalities is probably somewhere between 13 and 303. How long did GM know about this? GM engineers experienced a seemingly related problem when it was testing a Saturn Ion in 2001. Internal reports from GM indicate that the problem was solved with a redesigned switch. In 2004, however, another GM engineer driving a Chevrolet Cobalt hit the key and accidentally shut the car off. That is apparently the first time GM became aware of the problem that ultimately caused this recall. Why did it take GM so long to recall these cars? When the problem first surfaced it wasn't thought to be a safety issue, according to documents GM shared with the National Highway Traffic Safety Administration. Drivers could still still steer and stop the car and they could restart it. GM says its safety engineers weren't aware of any deaths as a result of this issue until 2007. It then took GM engineers years to trace the problem back to a defective ignition switch, according to the papers. Will GM be held accountable? Currently, GM faces a criminal probe by the Justice Department as well as investigations by Congress into this delayed recall. The National Highway Traffic Safety Administration is also looking into whether GM recalled the cars quickly enough. GM could be fined as much as $35 million if it decides it didn't act quickly enough. There are also a number civil lawsuits filed on behalf of people killed and injured in crashes. How come NHTSA wasn't on this sooner? The National Highway Traffic Safety Administration has a massive database of fatal car crashes that happen throughout the United States. The agency also collects consumer complaints about potential safety issues. Still, NHTSA failed to notice a trend of deaths attributable to this problem. In its defense, NHTSA points out that finding trends within such a tremendous amount of data can be difficult. How will the ignition problem be fixed? These cars were built using a defective ignition switch. A better ignition switch was installed in cars built after the 2007 model year. GM dealers will replace the defective ignition switch in the recalled cars with the new, redesigned switch. When can my car be fixed? GM says repairs will begin April 7, citing the time it takes to manufacture and distribute such a large number of ignition switches. If you have one of the models that came with the faulty switch installed, you should have already received a letter alerting you to the recall. Customers in the most recent expansion of the recall will receive a letter in April, the company said. Another letter will arrive later telling you to make an appointment to get your car fixed. I'm worried. Should I stop driving my car? For now, GM advises drivers to make sure that there isn't anything hanging from their car key that could knock it out of place. An attorney representing the owners of a GM car has asked a federal judge in Texas to force General Motors to tell drivers their recalled cars are not safe and to stop driving them. GM dealers are authorized to provide loaner cars to owners who are really scared about this issue. That will be handled on a case-by-case basis.